Well, ladies, you did it! You survived the first two trimesters. No, I don’t want to scare you but the third trimester was a hell for me. I still remember it. The good news is, when your baby comes in this world, you will instantly feel better and forget everything. You will hold your little one soon. 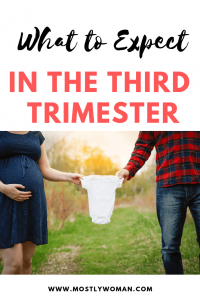 What to expect now when you are in your third trimester? What is normal? And, how to know if it is time? I will share with you mine experience but I do hope you will feel much better than me. Every woman is different. Every pregnancy is different. Please don’t expect everything you hear or read happen to you too. CONSULT with a professional and your doctor about every strange sign or feeling you have. From week 28 up until you gave birth 40-42 weeks (when the baby is ready to hug mom), you are in your third trimester of pregnancy. Usually, labor starts anywhere between week 38 and week 41. If you pass week 42 then your doctor will induce labor. Your baby will grow so much this trimester. When I reached 8th month I was huge. Be prepared for stretch marks if you didn’t get them until now. My experience with the third trimester wasn’t as I expected. I didn’t expect to feel so much pain in the hips. I couldn’t sleep. My back hurt so bad, I was constantly crying. If I go back, I would ask for more support. Someone to talk to and tell me that everything will be alight. I was scared of labor. What to do, will it hurt that bad? No epidural! Everyone had a different experience and everyone had their opinion on everything. Now, after delivering I can tell you that labor and delivering my baby was the best experience. It was so natural. I knew what to do. Painful – YES. My advice is to educate about labor this trimester. Read experiences, read about labor pain, about contractions, mucus plug and everything related to it. Learn how to breathe and push. Even if you plan a C – section. Who will be with you? Do you want more privacy? But if you plan to breastfeed then PLEASE educate now. When your baby is born, you will be so overwhelmed and breastfeeding is definitely not something easy. At least it wasn’t for me. My mother is a doctor so I was lucky. She was my support and educator. She is the reason my baby is still breastfeeding now. Here you can find everything related to breastfeeding. This site had an answer to every question I had. You will have plenty of time to educate in the third trimester. Prepare your breasts too. You can put lanolin cream or some other cream to soften them. Do you have a crib? Do you plan to co-sleep? Where will your baby change? Prepare the clothes and everything you think you will need for the first month. Have at least 4 different outfits, baby blankets, towels, diapers, creams, lotions, a place to bath the baby, a place to change diapers etc. Enjoy it! Wash and iron baby clothes. I still remember the day when I washed my baby tiny clothes. I remember the smell and excitement. Who will be with you and baby at least the first few weeks? I definitely don’t recommend being alone with the baby. Recovering from labor often lasts about 6 weeks. The third trimester of pregnancy is the perfect time to decide who will be with you. My husband was with me after delivery. He helped me with the baby and with cooking and cleaning. Close family members also. There are million other symptoms. If you have severe pain or just a strange feeling please visit your doctor. These are just the most common in the third trimester. enjoy with your partner (if this is your first child – your life will change). This list is too long. If you are expecting your first child this is the time only for you. Enjoy with your partner alone, go out with your friends, watch movies, eat your favorite fast food, practice self – care, visit your hairdresser, have a pregnancy massage, etc. AND EDUCATE! This is my great advice. I made a big mistake I was only educating on pregnancy and never ever on postpartum care, parenting, breastfeeding, recovering. Don’t make the same mistake. I wish you all the best! Soon you will hold your baby and be the perfect mother in the world.